Have you thought about how your spring lawn care plan might vary this year given the drought? In an earlier blog post, we shared resources that we rely on for information on assessment and prediction of climate conditions. All of this information affects the methodology and timing we use to perform our seasonal services. For Spring 2013, GH’s approach is based on drought-like conditions we’ll continue to experience in Minnesota coupled with a good dose of our standard Step-by-Step Spring Clean-up Services. We’ve been seeing white (as in snow) for several months. Now we’re eager to see green (as in a beautiful, plush lawn). As I consider how GH will adjust our spring services based climate, new research findings and ever-changing lawn-care techniques, I’m reminded that GH should be a steward of the environment and educate our clients. So I’ll share two thoughts with you: planning and patience. 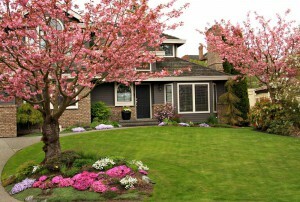 Our spring services can help you create a plan to set up your lawn for a great summer. We offer leaf removal (lawn raking and gutter cleaning), aeration, fertilization, seeding and dethatching and irrigation maintenance. Leaf removal is pretty standard for starters, but as I moved on to a review of improving our services for the remainder on the list, certain information stood out to me as critical. Aerate in Moderation: Research from the University of Minnesota continues to churn out seasonal research and recommendations for soil prep and treatment options including aeration. At GH, we’ll assess aeration needs accordingly. For example, the U of M asserts: If your lawn is stressed from lack of moisture, typical aeration practices will add more stress to the lawn, so we may recommend only to irrigate. GH seconds these findings and offers aeration only in the spring, when temperatures are cool, our most seasonal moisture typically comes from rain and the summer stress of heat and dry weather has yet to begin. If you’ve been irrigating with little turfgrass response, soil compaction may be an issue, in which case aerating would help and we may recommend that. Use Natural Organic Compost Topdressing: Grass has a reputation of being a “heavy feeder,” requiring lots of fertilizer. But that’s true only of lawns that contain little organic matter, worms or other soil life. Consider topdressing your lawn with our screened organic compost dressing. Spreading ¼ to ½ inch of our rich compost will increase the life and microbial activity in your soil, and add natural fertilizer. At GH, we advise using organic fertilizers because they release nutrients slowly over time to provide long-term nutrition, improve soil health, and encourage soil life. They also provide vital trace nutrients that your lawn needs in minute quantities.